A quick blog entry about a beer that I've enjoyed a couple of times now. Saints & Sinners Beer Co - attempting to restore some sense of prestige and worth to the facility - have brewed Hoptimum at the Brew Wharf in London Bridge. The beer is a 5.2 per cent pale ale flavoured with all American hops. 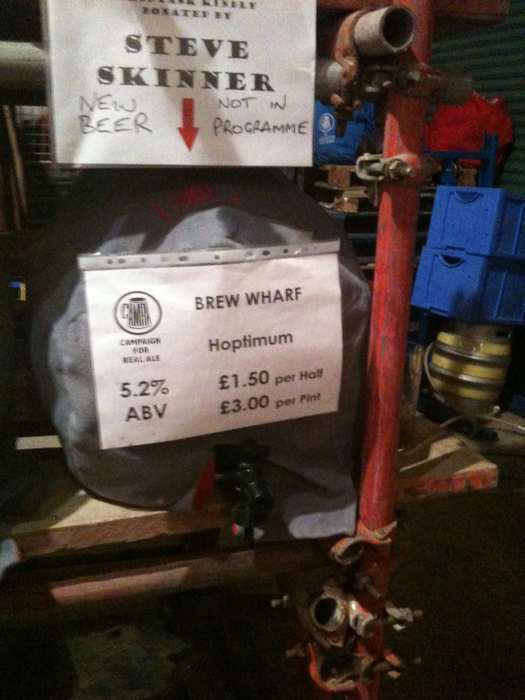 A week or so ago I tried it at an event to celebrate the tapping of the first cask, and this weekend just passed I had it again at the Planet Thanet Beer Festival. Hoptimum pours a light golden colour with a thin lacing of white head. The body is light with minimal carbonation. On the nose you get a punch of citrus with a floral note chasing behind. On the palate that floral citrus comes through, building to a crisp, dry bitterness. The combination of this with the light body makes for a very refreshing and incredibly drinkable beer. Minor criticism would be that, at over 5 per cent, the body does leave you a touch wanting. Whilst the dryness of the finish is nice, a touch more sweetness could give better overall balance. This is nit-picking though. A very enjoyable beer, made doubly impressive by the fact that it's the first time the brewer and brewery have come together. I'm looking forward to future brews and I'm glad there's a reason to visit Brew Wharf again.